Inkshed no longer offers conferences or creates newsletters, but it still exists as an active publishing house, extensive online archives of newsletters and email, and many intense memories. When Inkshed took shape in the 1980s, Canadian universities had only a weak tradition of teaching writing. Where first-year composition existed, it was usually grafted onto a literature course to show students correct essay structure and grammar. A few engineering and business schools required courses on workplace genres, also emphasizing correctness. Some universities had writing centres offering individual tutoring, but they tended to be hidden in back rooms and seen as charitable measures for underprepared students. Inkshed began in the early 1980s as discussions among innovative faculty in a small east-coast liberal-arts college, then attracted others who wanted new ways to think about teaching writing and reading at the university level. From the first, Inkshed conferences tried to enact the principles of dialogue and collaboration. The first one I attended, in 1994, asked participants to work in groups ahead of time and at the conference to produce a publishable article. I was placed with three people who had far more experience than I did; amazingly, we actually finished a draft and stayed friendly afterwards. I joined in the activity of “inkshedding” too, writing out comments after each of the other group’s presentations on work-in-progress, then watching the scribbles circulate and get commented on in turn. Organizers collated these “inksheds” each evening, typed them up, and printed the set for further circulation the next day. Not all the groups worked well, and the inksheds were occasionally biting and sometimes irrelevant. I got tired too of being expected to comment on every presentation. But the collaborative experience showed me that even senior scholars had to be tactful as well as pointed in working with others, and that intense questioning and hypothesizing made a fine way to generate new ideas. The newsletter began in 1982 as a mimeographed broadside for Canadian academics who otherwise saw each other only at US conferences. It soon became a dynamic and efficient way to connect people across the country with five or six multi-page issues a year. The excitement of connecting with like-minded colleagues is palpable, even a bit giddy. The subject range was “writing and reading theory and practice” as the masthead put it. Besides discussing (and disagreeing on) the challenges of trying to teach high-level literacy while fostering creativity and self-expression, contributors sent reviews and lists of relevant books, articles, and conferences. In a country where almost nobody had studied writing or composition as a graduate field, the humble Inkshed newsletter was an instrument for self-education. But it was a process shared with others. For many years the cover page ran a quotation from Kenneth Burke about coming into a parlor where a heated discussion was already happening, with newcomers gradually raising their voices and joining in, agreeing and disagreeing, and then taking the discussion in new directions. For me, that’s the key description of the Inkshed experience. 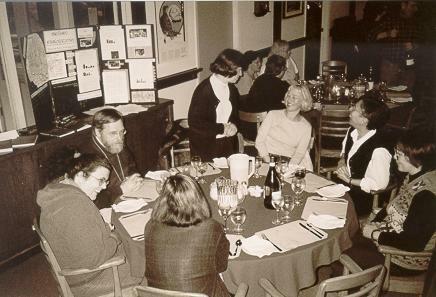 An early Inkshed conference, with Russ Hunt seated at left and Marcy Baumann to his right. Inkshed welcomed everyone interested in its topics, but attention to writing-centre issues was seldom explicit. Looking back through the archives of early newsletters and conference notes, I’m struck by what seem like missed opportunities to point out that working one-on-one with students exemplifies the Inkshed goals of creative dialogue and collaboration. The first article on writing-centre teaching is discouraging (2.5, September 1983). An eminent rhetorician “disclosed” (as he put it, with a hint of self-mockery) that he found the idea of helping students edit drafts unethical and probably ineffective when outside the tutor’s own discipline. The new writing centre at his university, therefore, would look only briefly at marked papers and then assign students to write new ones on general topics if they wanted to receive instruction on their writing. Inkshed’s dialogism was in evidence in the next issue (2.6, December 1983), where another author briskly pointed out the flaws in this reasoning and showed why writing centres should look at real assignments and involve faculty from a range of disciplines. Still, browsing through the Inkshed archives shows an undercurrent of anxiety and defensiveness. A note suggesting topics for the 1995 conference, for instance, mentions “the general crisis of writing centres.” Jim Bell’s excellent article about using retrospective student surveys to evaluate writing-centre impact was titled “Small-Scale Evaluation for Writing Centres in These Times of Trouble” in its Inkshed appearance (14.7, December 1996). 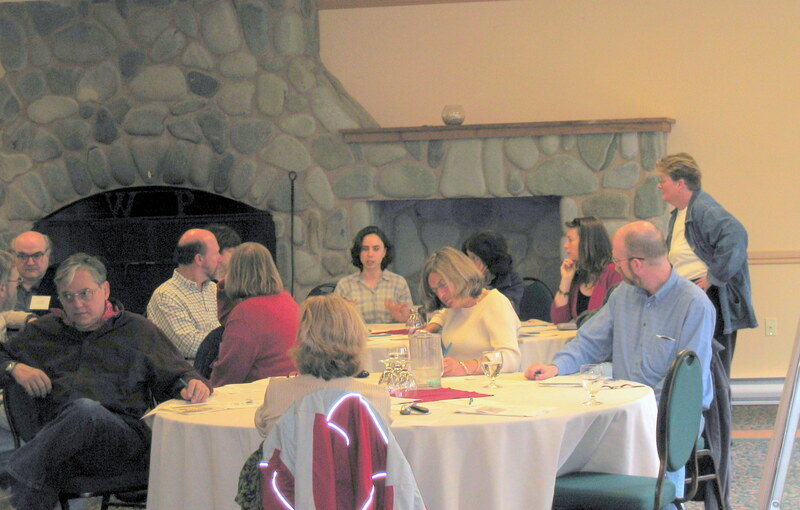 Several pieces try to move perceptions of writing centres beyond the “remedial” label. Jan Rehner’s piece “What Happens after You Say ‘Please Go to the Writing Centre’” (13.3, February 1995) gives a strong answer as if to uninformed faculty members – but directed here at those who read Inkshed. Jim Bell followed up with “Misconceptions about the Writing Centre” (14.1, September 1995). It’s satisfying to see Mary Mar, a few months later, confidently claiming writing-centre ownership of key Inkshed concepts. In “The Community and the Discourse of a Writing Centre” (14.3, February 1996), she explains incisively and calmly how oral communication in the absence of an evaluative relationship can generate exchange across disciplinary boundaries and create a powerful learning environment. Inkshed 22, May 2005, White Point, Nova Scotia: Nan Johnson standing at right, with Rick Coe relaxing at left. By the late 1990s, writing centres were recognized as key components of the new Canadian field of writing studies. A survey by Henry Hubert and Susan Bell (14.6,September 1996) confirms that there were many writing centres in existence, though it notes that many of them were precarious. In an October 1998 listserv exchange on “the Canadian question,” the Inkshed founder Russ Hunt proposes that writing centres and disciplinary WID initiatives are the Canadian alternative to first-year composition courses. Wendy Kraglund-Gauthier’s 2006 article on the history of Canadian writing centres (23.1, Spring 2006) sits alongside a piece by Miriam Horne on the history of Inkshed: both are based on graduate theses in Canadian universities. I still smile to note the contrast between the titles of two important accounts of Canadian writing programs. In 1994, the first book from Inkshed Publications, Roger Graves’ Writing Instruction in Canadian Universities, outlined the topic in terms of courses. 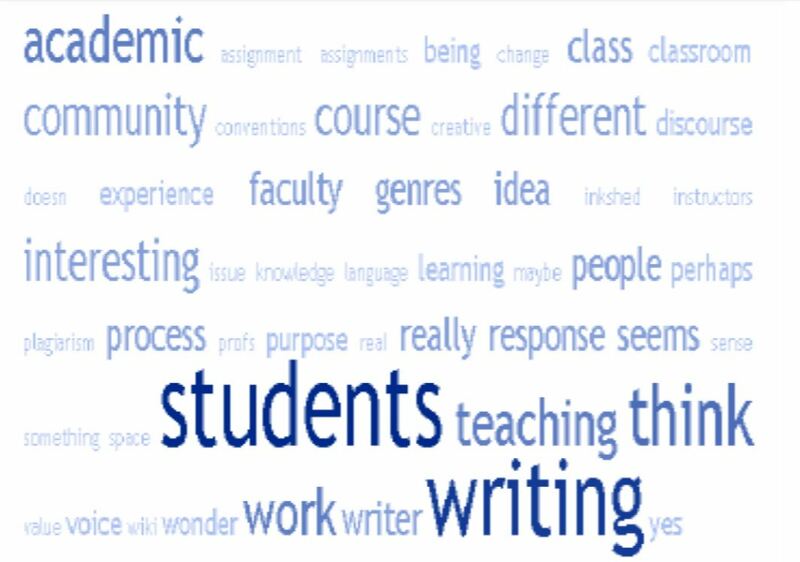 My university was present only in quotations showing the disdain of English professors for all writing instruction. Writing centres weren’t mentioned. But in 2006, a collection on the same topic edited by Roger and Heather Graves was titled Writing Centres, Writing Seminars, Writing Culture. It included two chapters about the development of University of Toronto writing centres into secure and inventive programs. In another Canadian collection published by the WAC Clearinghouse in 2011, I was able to disclose more of the background story for those writing centres and to include a reference list about the wider topic. By then, however, Inkshed as an organization was faltering—both because it had never adopted a self-renewing leadership structure and because other organizations had developed clearer focuses. Ironically, it seems that Inkshed had encouraged the development of writing programs that now had other needs than discussing foundational ideas. No Inkshed newsletters were published or conferences held between 2009 and 2012 – though characteristically intense and witty discussions erupted occasionally on the Inkshed listerv. An attempt at revival of the conference and newsletter in 2012 made many people happy, but not enough of them were engaged enough to keep it going. One of the surviving and in some ways successor organizations is CASDW (the Canadian Association for the Study of Discourse and Writing). It also began in the 1980s, as an association about technical writing. With a change in name and focus, its conferences and journal now present sophisticated research and theoretical discussions, including attention to the Canadian specialty of rhetorical genre studies. Since its leaders and members largely overlapped with those of Inkshed, it seemed natural, when the decision to wind up CASLL/Inkshed was made in 2017, to ask CASDW to provide online space for Inkshed archives. The complete set of newsletters, with some conference notes and photos, is now available as a section of the CASDW website. Please bookmark https://casdw-acr.ca/resources/casllinkshed-archives/ for your own enjoyment, and help train Google to index it more reliably. You may already know the other sister organization, the new and dynamic Canadian Writing Centres Association (CWCA). Have a look at its 2018 conference program to see the depth and breadth of its interests. CWCA is strongly committed to language and cultural diversity, and combines challenging self-questioning with practical discussions. It has a solid structure and has attracted excellent leaders. Admire the attractive website at https:/cwcaaccr.com/. It was these two organizations, along with Inkshed in its declining years, that formulated an impressive 2016 Statement on Writing Centres and Staffing. Responding to recurrent reports of writing centres being changed into student-service operations, the statement makes a clear and confident case for their academic standing. The descriptions of teaching and learning are inspiring. They are based on respect for the knowledge generated by writing as a field of study and on the value of the learning produced by interdisciplinary and interactive teaching. From my old-timer’s perspective, I like to think that Inkshed—even if sometimes only indirectly—contributed to the ideas that still animate and justify Canadian writing centres. Next Next post: CfP || The Fall 2018 edition of The Dangling Modifier is now inviting submissions! Wonderful article! So informative and comprehensive. Thanks to Margaret and all the Inkshedders. This is a great piece! Hi Margaret! I interacted with Inkshed in the mid-2000s. It was really important to me as I was starting out in Writing Centres. I loved inkshedding at the conference and was able to publish two pieces of writing in peer reviewed journals as a result of what I tested out there. Lots of good thinking at the conferences I attended. Grateful.